But there might be cases, to be more precise, when I might split up the criteria and give, say, ★★ for quality of writing and ★★★★ for the amount of enjoyment I got out of a book, averaging it out to ★★★. Bear in mind that there is the distinct possibility that I am over-thinking this whole damn thing. Whatever. Let's review a book. 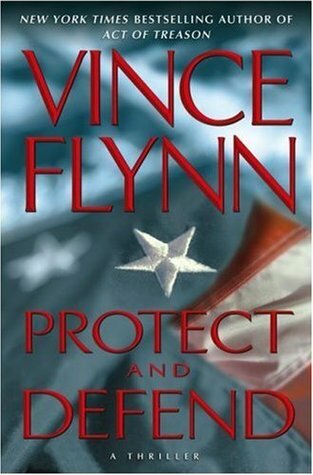 Vince Flynn's Protect and Defend is a case where two stars seems to fit so well. 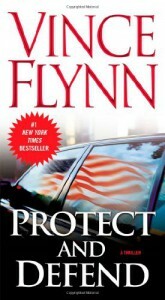 Eighth chronologically in the the Mitch Rapp series, tenth in actual publication and the second Vince Flynn novel I've read, Protect and Defend, is not an awful book, but it falls short of the kind of thing I was expecting after reading Flynn's American Assassin. In short, it's slow and, while the action that one expects is pretty okay, it occurs far too late in the game for me to get excited about it. A bit of fair warning: there may be in this review what some may consider a spoiler in this review. I don't consider it as such, but don't say I didn't warn you. Protect and Defend begins with Rapp hanging out in Costa Rica with a female agent named Maria Rivera, getting ready to assassinate some American political advisor who was complicit in a politically-motivated bombing that resulted in the death of Americans. A little "non-judicial punishment" Rapp style. Anyway, the details don't really matter because this whole event had nothing to do with the rest of the story whatsoever. Even Rivera disappears from the story after doing nothing at all. 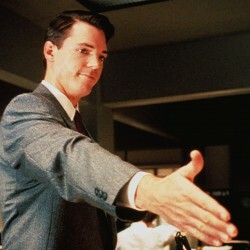 We do learn that Rapp is getting over the murder of his pregnant wife, something that happened in a previous episode. Meanwhile, a covert Israeli operative manages to sabotage an Iranian nuclear facility, devastating the entire site. The Iranians are quick to blame Israel and the United States, although they have no evidence against either parties. So, to conduct some damage control, CIA director (and direct Rapp's boss) Irene Kennedy is sent over to Mosul, Iraq, to meet the Iranian intelligence director Azad Ashani and hash things out. Of course, Rapp is in tow to conduct security. Good thing, too, because now the story finally gets rolling (over two hundred pages into the book!). Kennedy gets kidnapped by a rogue Hezbollah leader working for the Iranians and Rapp will spare nothing to get her back. That was the possibly spoiler-y bit I mentioned earlier, but it's not really a spoiler because all that stuff that happened in the first half of the book just felt like backstory, set up and fluff and it isn't until the book is over halfway through that Rapp really begins killin' terr'rists, which is way too long of a wait to get the action going. The pace in Protect and Defend killed me. By the time Rapp got to the point where he was shooting bad guys in the face I was too tired to care. That was the main thing that did it for me. The pace was totally off and it seems like first whole half of the book was just padding. Part of what contributed to this, though is Flynn's multi-perspective approach, which some love and some don't. I don't. Flynn follows the perspectives of Rapp, was well as the politicians in D.C., the politicians in Teheran and the bad guys. On the one hand, this allows us to see characters that are far more interesting than our hero Mitch Rapp (more on this later), but on the other hand it's stuff I don't care about. If you ever watched that TV show 24 you know what I mean. I never cared about all the political shenanigans. I just wanted to see Jack Bauer do his thing. It's like that here. I guess that's why these novels are called "political thrillers" but that stuff leaves me cold. Of course, there is plenty of action in Protect and Defend, but far little and it occurs far too late. But while Protect and Defend didn't do it for me, Flynn's got some interesting things going on. Like I mentioned before, Mitch Rapp is probably the least interesting character in the cast. He's a driven, single-minded "loose cannon who doesn't play by the the rules" covert operative, but there doesn't seem to be much more to him than that. Even though I've just complained about Flynn's multi-perspective approach, it does provide characters that are far more interesting than Rapp, like Azad Ashani, the sympathetic Iranian intelligence director. Indeed, it seems like Flynn's supporting characters are far more fleshed out than the hero of the series. As for Mitch Rapp, I definitely see potential for him being a really interesting and unique character. Unfortunately, as in American Assassin, Flynn doesn't quite follow through on this as well as I would have liked. Rapp himself is a bit of an extremist and I would have liked to have seen more examination of this side of his personality that places him in dangerously close proximity to the mindsets of the terrorists he kills. And, of course, I would have liked to have seen more on how Rapp is dealing with the death of his wife. Rapp's bosses note that he's becoming more reckless and hard to control, but I'll just have to read more of the books to see if his character really develops from this. These Rapp books are pretty much like Jerry Bruckheimer films or something, so I don't expect much literary merit, but I'd still like to see Rapp become more real to me. Right now he's little better than a robot. Not to belabor the point, but Vince Flynn passed away last summer from cancer at the age of forty-seven and I feel bad about being too negative, but Protect and Defend just didn't do it for me. But on the positive side, I am interested in reading more of Vince Flynn's stuff. I'm just hoping that in the other books there is less talky, more shooty. The verdict:★★✩✩✩, for being a tolerable read, but far too slow and lazily paced to really be interesting.